Acma, Turkish style soft bagels have always been one of the Turkish style breakfast treats at home for us. 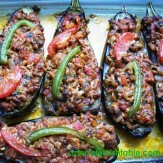 It is also a delicious snack you can enjoy with cup of tea, Turkish cay, all day long. I had a chance to recreate these delicious bagels at home recently, everyone enjoyed them. We have been pleased with the result; they turned out softer inside and a little crispy outside (this home made version is a little crispier than the Acma you get in Turkey but still very delicious and satisfying). You can enjoy Acma, sliced in half, and buttered with jam or honey. They are also delicious with a cheese of your choice, sliced cucumbers and tomatoes aside. 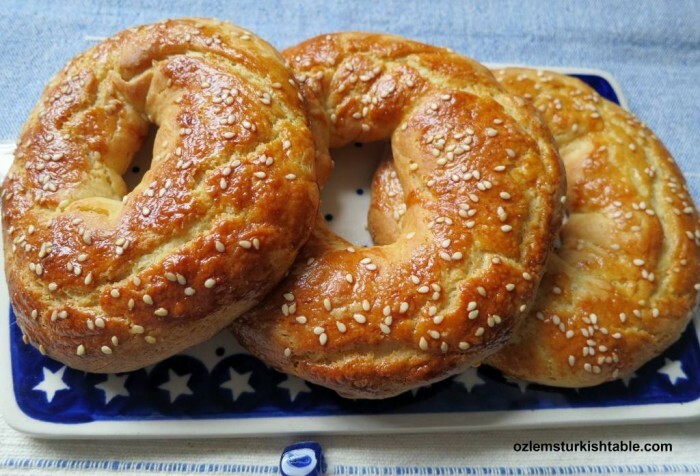 Acma, Turkish style soft bagels have always been one of the favorite Turkish style breakfast treats at home for us. 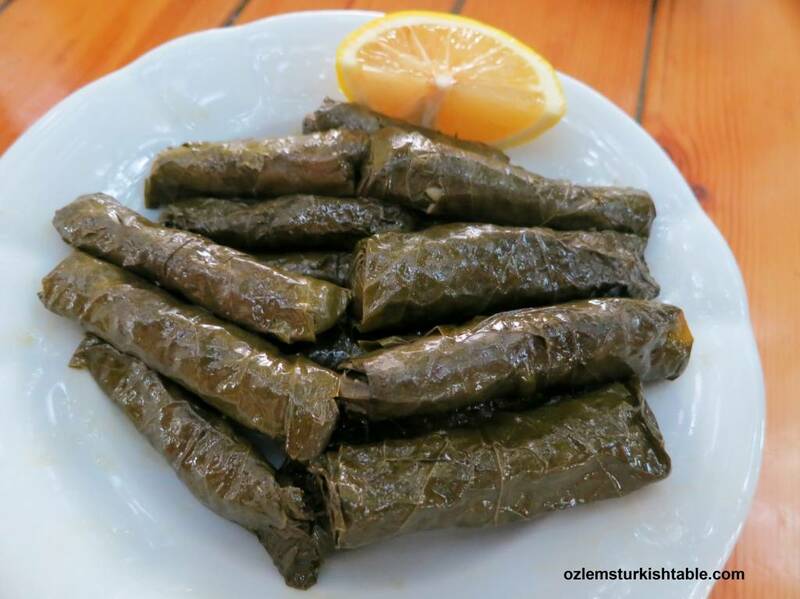 It is also a delicious snack you can enjoy with cup of tea, Turkish cay, all day long. 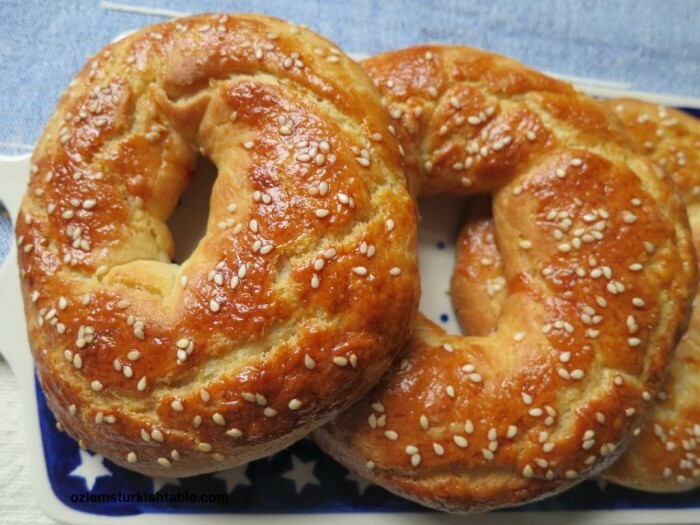 I had a chance to recreate these delicious bagels at home recently, everyone enjoyed them. Hope you enjoy making Acma at home! Combine the yeast with warm water in a bowl, stir well and let the yeast dissolve for a few minutes. Add the sugar, warm milk and the olive oil to the mixture, stir for the sugar to dissolve. Sift the flour in a large bowl and stir in the salt. Make a well in the middle and pour in the yeast mixture. Combine and knead the dough for a few minutes; you will get lovely, soft dough. Cover the dough with a cling film and tea towel and leave to rise at a warm spot (near an oven or in a warm airing cupboard works well) for 2 hours. The dough will double in size. Once doubled in size, divide the dough into 6 balls. One at a time, roll each dough ball between your palms to make it about 16 cm / 6 inches long. Then swirl and roll and seal the two ends together. Repeat this with the rest of the dough balls. Place the Acma rolls on a baking paper on a tray, making sure there are minimum 1 inch / 2.5 cm. between each Acma roll, as they will expand while baking. Brush with the egg mixture and sprinkle sesame seeds over the top if you’d like. Bake in the preheated oven (200 C/ 400 F) for 10 minutes. Then turn the heat down to 190 C / 375 F and bake for another 10 minutes or until the Acma has a rich, golden color. 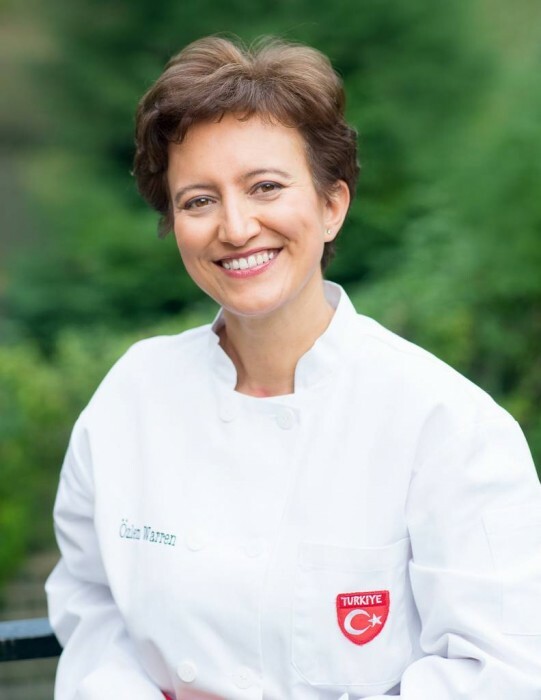 I am delighted to share my next Turkish cookery class on Wednesday, July 13th, 10 am – 2 pm at the Blid&Hatton Gatherings (The Food Studio) at Medicine Garden, Cobham, England. 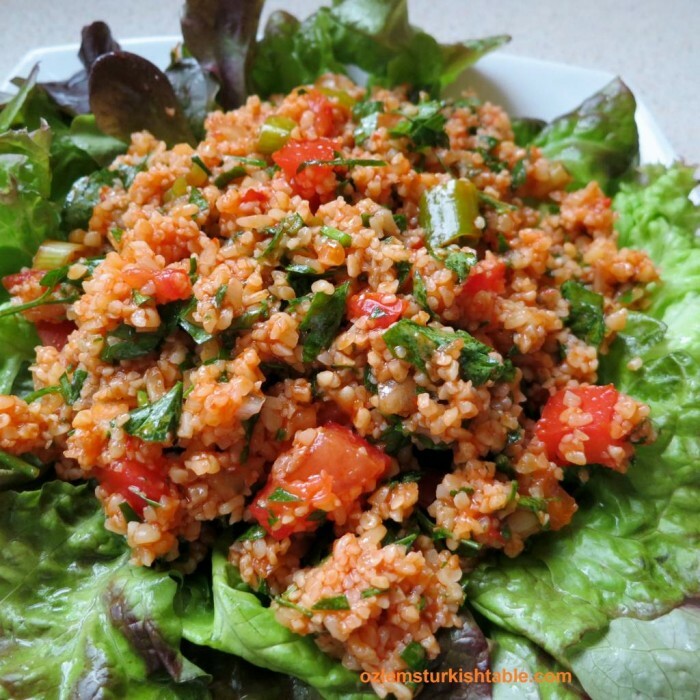 We have a feast of a class featuring wholesome and delicious spicy bulgur wheat salad with pomegranate molasses, Kisir, ever-popular stuffed aubergines with minced meat and vegetables, Karniyarik, savory filo pastry with spinach & feta, Ispanakli Borek, stuffed baked dried apricots, Kayisi Tatlisi and more. Here’s the details and booking information, booking will be through the Blid & Hatton Gatherings, the Food Studio at this link. Early booking is advised and the participation is limited. We Turks love these stuffed flat breads, Gozleme. Turks were originated from Central Asia, where they drifted towards Anatolia gradually and made their home. They have been making these stuffed flat breads called Gozleme since then and they are a much loved Turkish street food and a special part of Turkish breakfast. These popular snacks are cooked quickly on a hot griddle and can be filled with various fillings. 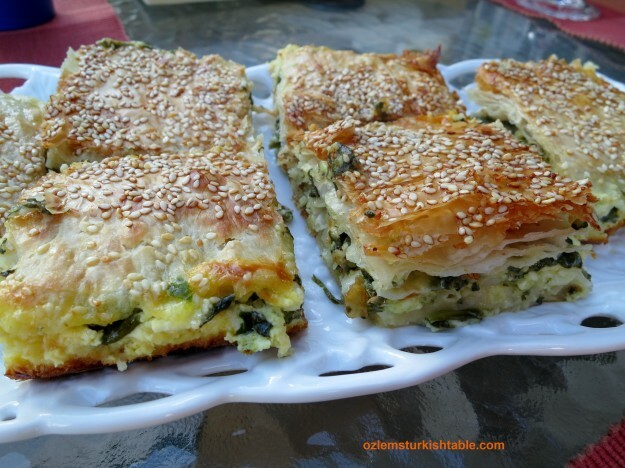 I previously made Gozleme with spinach and cheese filling, they became hugely popular. This time I made them with mashed potatoes, cheese and parsley; a comforting, delicious combination, another winner with family and friends. 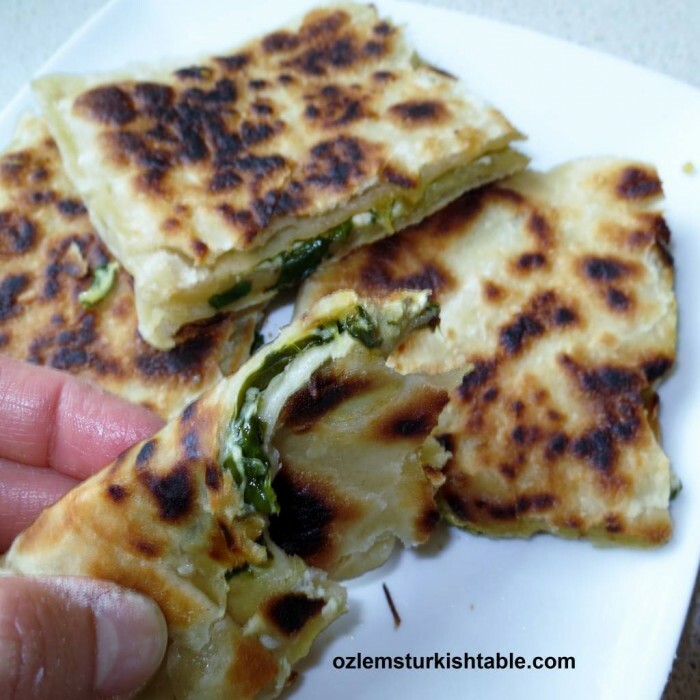 This gozleme is also a wonderful way to finish up leftover cooked potatoes and bits of cheese. 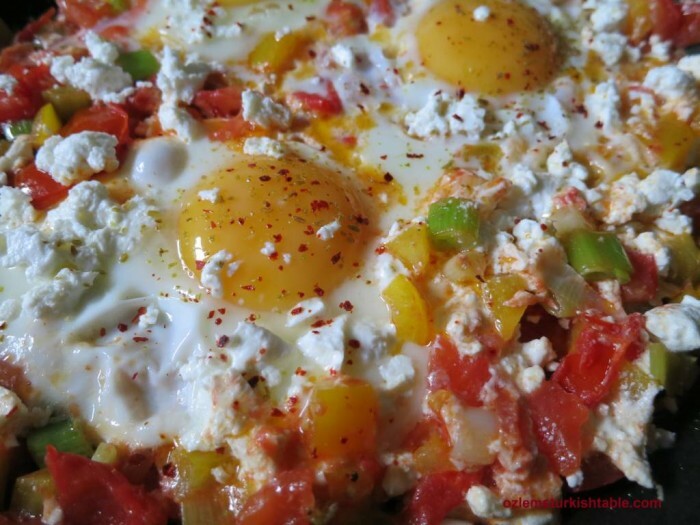 I used feta cheese here, you can also use Turkish white cheese, grated cheddar cheese or mozzarella. I spiced up my gozleme with a little Turkish red pepper paste, biber salcasi; you can also use red pepper flakes instead if you are after a touch of spice. 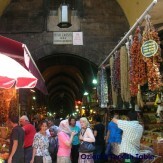 I hope you enjoy making your own Gozleme, a wholesome, delicious street food at home. 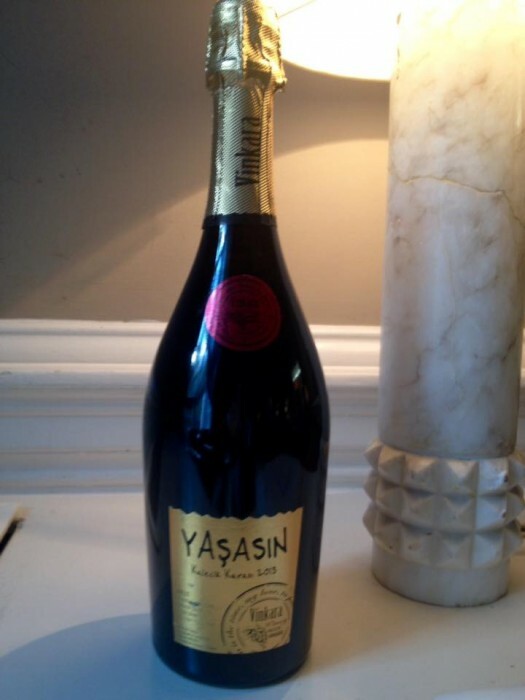 They go down very well with a glass of Turkish tea, cay or ayran, traditional Turkish yoghurt drink. 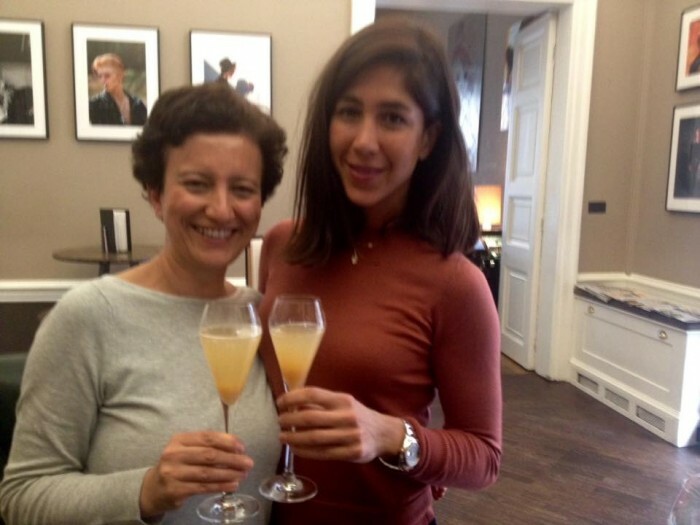 My Turkish Cookery Classes at Divertimenti Cookery School, London now open for Signing Up! 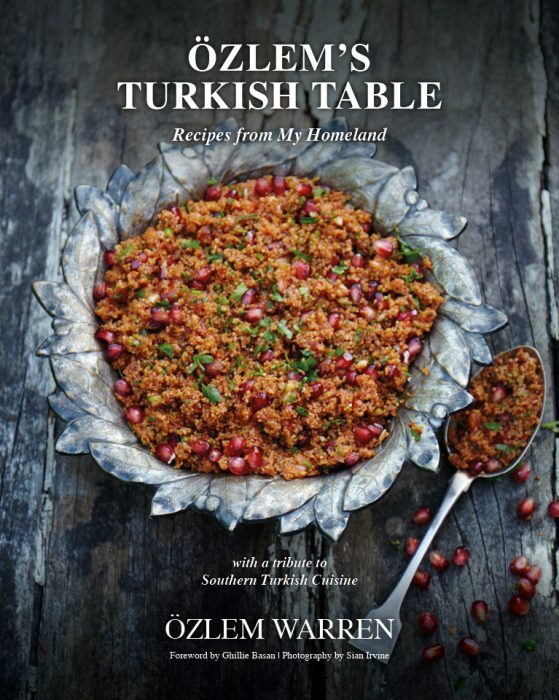 I am delighted to be teaching Turkish cookery classes at the wonderful Divertimenti Cookery School in London; on Tuesday, October 13th (demonstration class) and Sunday, December 13th 2015 (hands on class). You will be learning how to recreate delicious, wholesome Turkish classics such a spinach and feta filo pie, Turkish classic stuffed aubegines, spicy bulgur wheat salad with pomegranate molasses and home made baklava (much lighter and delicious! ), stuffed grape vine leaves, Turkish flat breads with toppings and many more. You will be amazed to see how easy each course is, wholesome and packed with flavor. 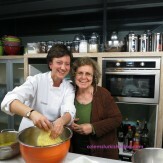 Details of the classes are at here, as well as at the Divertimenti Cookery School website. Signing up for these classes are through Divertimenti Cookery School at this link, hope you can join us! 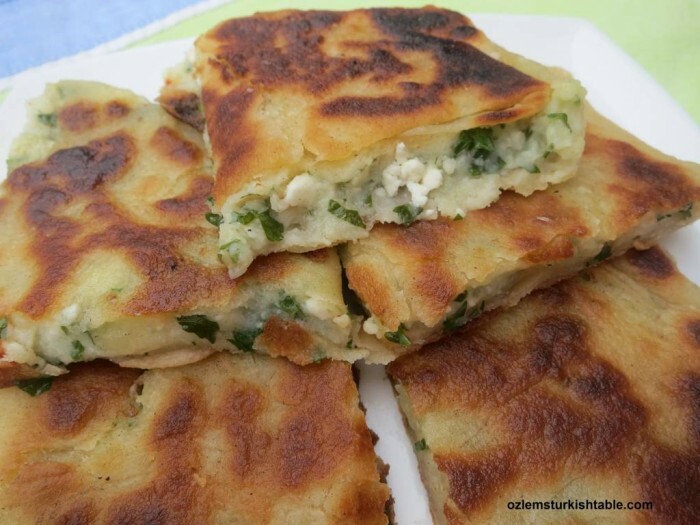 We Turks love these stuffed flat breads, Gozleme. Turks have been making these stuffed flat breads over thousand of years, they are a much loved Turkish street food and a special part of Turkish breakfast. 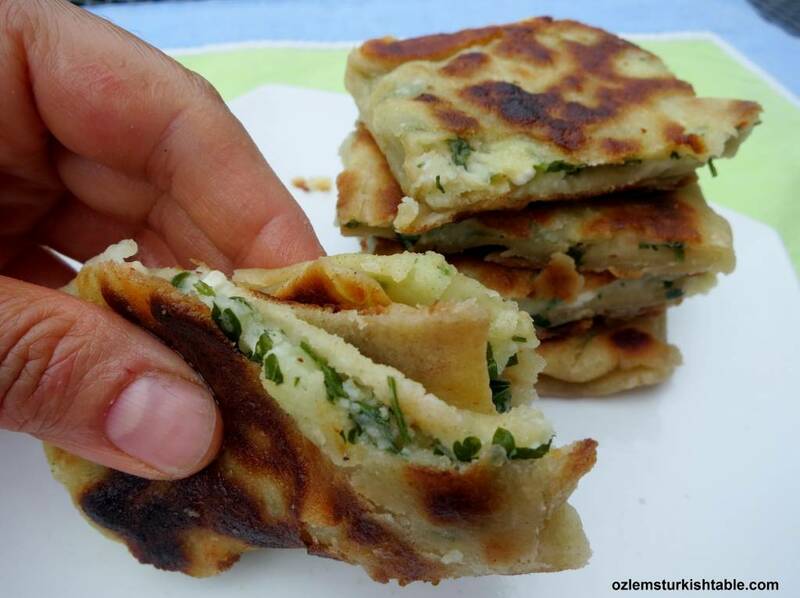 The mashed potato, cheese and parsley proves to be a delicious, comforting filling; these gozlemes are wonderful with cup of tea or as part of mezze spread. 200gr/ 7 oz. Turkish white cheese or feta cheese, juice drained and crumbled. Combine about 150 ml / 5 fl. oz. warm water, yeast and salt in a small bowl, stir and cover. Stand in a warm place for 5 minutes or until bubbles form on the surface. Sift the flour into a large bowl. Make a well in the middle and pour in the yeast mixture, olive oil, yoghurt and the remaining (about 110 ml/ 4 fl. oz./ ½ cup) water. Using your hand, draw in the flour from the sides and work the mixture into a dough. Knead thoroughly to form a soft dough. Divide the dough into 8 pieces, knead them and roll into balls. Place the balls on a floured surface, cover with a damp cloth and leave them to rest for 30 minutes, or until the dough doubles in size. Meanwhile, prepare the filling. Mash the cooked potatoes with a fork or a masher in a large bowl. Drain the juice of the Turkish white cheese or feta cheese and crumble into the bowl. Stir in the chopped parsley, the red pepper paste or red pepper flakes (if you wish) and pour in the olive oil. Season with salt and freshly ground black pepper and combine all well. Your filling is ready. On a lightly floured surface, roll out each of the balls of the dough with a rolling pin into thin, flat rounds, about 40cm/16in diameter. Sprinkle a little flour as you roll the dough so that the dough won’t stick. Roll until you achieve a thin sheet of a flat round. Fold the left and right sides of the dough in a way for the edges to meet in the middle. Spread about 2 ½ - 3 tablespoons filling into the middle part of this flat sheet. Then fold the top and bottom edges over the filling, making sure all the filling is safely covered. Press edges together well to seal. Repeat the same procedure for the rest of the dough balls. Heat a griddle or a non-stick pan, and brush one side of the gozleme with a little olive oil and place on the pan to cook for about 2 -3 minutes, or until golden brown. Brush the uncooked side with a little olive oil and then flip it over. Cook for another 2-3 minutes, until golden brown. Brush both cooked sides of gozleme with a little olive oil -this will keep the gozleme moist. Cook the rest of the gozlemes the same way. 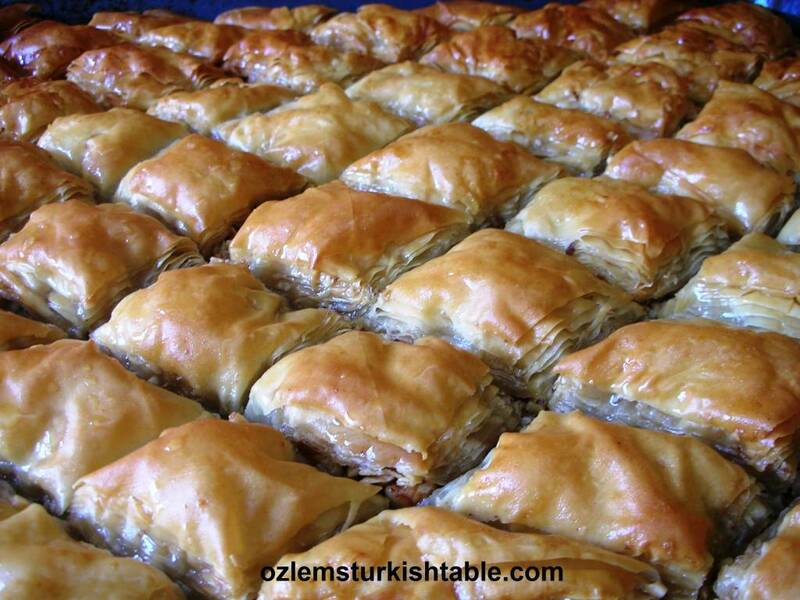 You can either roll the Gozlemes to serve, or you can cut in halves or quarters. Ayran, Turkish yoghurt drink or Turkish tea, cay would go really well next to Gozleme.